Eating at Azuri has never been more exciting, or easy. There are loads of places to grab a bite, or to sit down for elegant gourmet dining, and everything imaginable is available – or can be – at the snap of your fingers. If you wish, you don’t even have to lift a pinkie: your meal can be prepared and ready when you are. 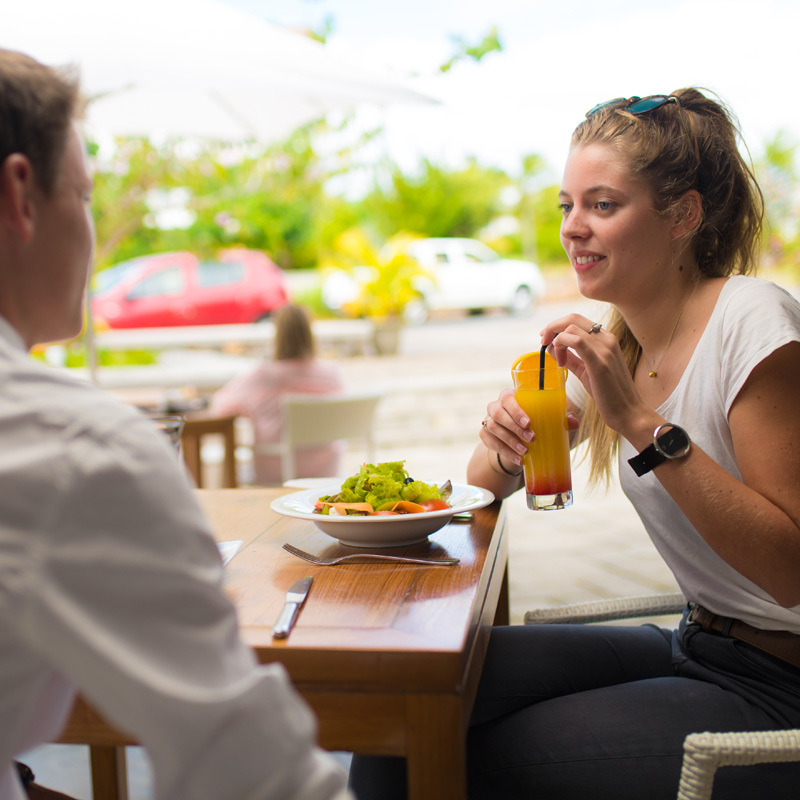 The Café now serves up two daily specials, such as a typical Mauritian sausage rougaille or octopus curry with creamy lentils, pickled vegetable condiments and spicy pepper sauce on top of a steaming mound of rice; or a sizzling grilled steak accompanied by crispy fries and fresh garden salad. There’s also a selection of pizzas and burgers, or an assortment of breads like buns, baguettes and panini topped with a choice of fillings. As always, pastries galore are offered with a coffee, as a fast snack, or at breakfast time. Don’t have time to stop by? Call from your office and you can pick up lunch, dinner, or croissants, on the way home; or if you’re already there, have it delivered ready-made or chilled, for heating up at your convenience. Desserts can be had too, at any moment, including a bag of icy popsicles or poptails (tinged with spirits), just the right thing to slurp on these warm summer days and nights. Fresh-baked breads and pastries are prepared by the cooks 5 times per day – for hours of availability, check the chalkboard inside The Café. The Café is open from 8:00 to 20:00 daily for on-site meals and get-togethers, take-away and catering. Call 4023781 for more info. Ô Marché Gourmet is also in the picture, and your favourite kitchen away from home can cook up an unforgettable dish for you and the family, or friends. Among Agnès’ specialties are sumptuous gratins stuffed with christophine or giraumon (Mauritian pumpkin), velvety meat and vegetable lasagnes, fluffy broccoli-n-salmon quiche, and her one-of-a-kind cakes: those savoury home-made breads tinged with mozzarella, fig, goat cheese, butternut, herbs and more. ÔMG, your convenience store with a capital ‘C’ doesn’t stop here. Planning a dinner party with friends, or for two? The gourmet shop will prepare a whole fresh fish draped in a curry, coconut, or orange sauce, wrapped lovingly in greaseproof foil for baking at home. Special orders will be taken too, and this is the place to order wines, whiskeys, and every local rum under the sun. ÔMG can also organise a private event or theme party, either at the boutique or in your abode. And if you’re going to the beach or out boating, ask for a picnic basket of deli delights like salami, hams, bread and cheeses, chocolate, wine; it will be delivered directly to the boat club at the appointed hour. Stop in at any time and Agnès will always attend to your needs. She will be pleased to tell you about her craft oils, flavoured with spices, fruits, or any of a variety of other appealing ingredients. Ô Marché Gourmet is open Monday to Saturday from 10:00 to 19:00 – Sunday and Public Holidays from 9:30 to 14:00.